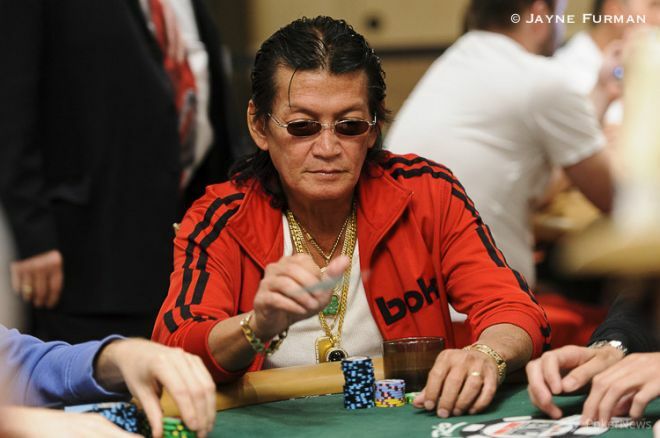 Scotty Nguyen has had one of the most decorated careers in poker history. But the legacy he wants to leave behind has nothing to do with bracelets or money. "You call, and it's gonna be all over baby." Scotty Nguyen uttered that iconic quote 17 years ago on the final hand of the 1998 World Series of Poker Main Event, goading Kevin McBride into calling it off on the river to ship Nguyen the bracelet and $1 million in prize money. That would prove to be the second of five, and the crowning moment in one of the most decorated careers in poker history. Nguyen would later add the Chip Reese Memorial Trophy — given to the $50,000 Poker Players' Championship winner — and a World Poker Tour title to his achievements, which include nearly $12 million in live cashes. Nguyen was in the midst of chasing bracelet No. 6, entering the unofficial final table of the $10,000 H.O.R.S.E. Championship in sixth place of nine remaining runners, when he agreed to take a minute on break and talk to PokerNews. Though it would seem Nguyen has nothing left to prove on the felt, he said he is still hungry. "Another bracelet," he said, when asked what motivates him to continue grinding. "I have three events left I want to play — this one, the $10K [Dealer's Choice], and the Main Event. It's good to get back to the final table, but I'm not going to jump up and down until the bracelet's in my hand." Unfortunately for Nguyen, he won't be adding that bracelet to his collection, at least in this event. He busted in seventh place for $66,579 when he lost the last of his short stack to Don Zewin, who turned three wheel cards into an eight-perfect in Razz. Final tables haven't been easy to come by in recent years for the "Prince of Poker." Nguyen has made just four since taking down the PPC in 2008 for $1,989,120. He came close to a bracelet in 2012 with a runner-up finish to Joe Cassidy in a $5,000 Omaha Hi-Low tournament, earning $182,213. Though Nguyen is best known for his no-limit hold'em successes, many of his recent deep runs have come in limit games, a format he said has its advantages over big-bet poker. "You know baby, no-limit you can play good all day for two straight days and then take one bad beat and you're gone," he said. "Here, I just took a bad beat when I had the guy beat on sixth street. He can get lucky, but it doesn't take me out." Expect Nguyen to continue bracelet chasing in between taking selfies with fans, but whether he wins or loses isn't what Nguyen wants to leave as his legacy in the poker world. Nguyen, whose behavior at the table of his PPC victory was condemned by many, said the personal relationships he has built in poker are actually what he wants to be remembered by. "When all is said and done baby, I want to return the favors of my friends who've always been there for me, friends like James Calderaro," Nguyen said, pointing at "Big Show," who was counseling Nguyen on break. "He picks me up when I'm down. When I have nobody to talk to, he cheers me up and brings me back up again." Nguyen knows money can come and go, having endured the brutal swings of the poker life for decades now, and he cherishes those who don't let success change them. "People don't remember when they were down and they got picked up by someone," he said. "When they're on top, they forget about it. I'm not like that." Want to stay atop all the latest from the 2015 WSOP? If so, make sure to get PokerNews updates on your social media outlets. Follow us on Twitter and find us on both Facebook and Google+! Phil Ivey discussing legacy and what bracelets mean to him.